A SpaceX Falcon 9 rocket stands on the company's launch pad at Vandenberg Air Force Base in California ahead of the Iridium-2 mission in June 2017. A similar Falcon 9 rocket will launch 10 Iridium Next communications satellites into orbit from the same pad for the Iridium-3 mission on Oct. 9, 2017. The private spaceflight company SpaceX is scheduled to launch 10 communications satellites into low-Earth orbit early Monday (Oct. 9), and you can watch it live online. A SpaceX Falcon 9 rocket is scheduled to blast off from Vandenberg Air Force Base in California at 8:37 a.m. EDT (5:37 a.m. PDT/1237 GMT), carrying 10 satellites for Iridium Communications. 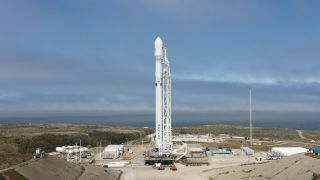 A live webcast is expected to begin 15 minutes before the opening of the launch window, and you can watch it on SpaceX's website, or here at Space.com. The satellites are part of the Iridium Next constellation, which will eventually consist of 66 primary satellites and nine on-orbit backup satellites (as well as six backups that will remain on the ground). This is the third of eight scheduled SpaceX launches for the Iridium Next constellation, and will bring the total number of satellites in orbit to 30. The reusable Falcon 9 booster that will be used in tomorrow's launch is making its first flight, a company representative told Space.com. It completed a static-fire test on Thursday (Oct. 5). SpaceX will attempt to land the booster upright on a drone ship in the Pacific Ocean following the launch so it can be used on a future mission. SpaceX has successfully landed a Falcon 9 first stage rocket 16 times and reflown two boosters this year. A illustration of an Iridium NEXT satellite in orbit. Iridium Communications announced earlier this week it had begun testing and validating its Iridium Certus service, which will use the Iridium Next satellites to provide a "truly global broadband service" to its users, according to a statement from the company. The 66 satellites will spread out around the planet to provide service to remote regions of the globe, the company has said. "Iridium Certus is going to fundamentally change the status quo in satellite connectivity for aviation, maritime, land-mobile, Internet of Things (IoT) and government users," said Matt Desch, Iridium's CEO, in the statement. "Achieving this major milestone continues our momentum for our mission to introduce world-changing broadband services and applications designed to help our partners provide critical connectivity solutions, both standalone and in support of other broadband technologies." The commercial service is expected to be available in the "early second quarter" of 2018, according to the statement. On Wednesday (Oct. 11), another SpaceX Falcon 9 rocket is scheduled to launch from NASA's Launch Complex 39A at the Kennedy Space Center in Florida, carrying another communications satellite called SES 11/EchoStar 105. The Falcon 9 booster for that launch, which was delayed from Oct. 7, has already made one spaceflight. On Feb. 19, the booster helped launch a Dragon cargo ship to deliver NASA supplies to the International Space Station and made a pinpoint landing on a SpaceX drone ship. Elon Musk wrote on Instagram this week that the company would also try to land that booster again.